In 2013 Edward Snowden let the world know that their emails, phone calls, text messages, and everything they were doing online, was being tracked by the US government and, often times, with the help of their local government. This was the surveillance of private citizens who had committed no crime, and for whom no search warrant had been granted. And even as this surveillance was being done, the leadership of the National Security Agency (NSA) told the US Congress that no, they were not spying on Americans. Were they lying? Well, it all depends on what they meant by "not spying." As the documentary recounts, in May of 2013, Snowden fled to Hong Kong with a computer full of classified NSA documents that proved this surveillance was going on. He showed some of them to journalist Glenn Greenwald and to the director of this documentary, Laura Poitras. It was only after they helped the story go public that the NSA then admitted they were recording and collecting all sorts of data on US citizens. But they insisted that while they had it, they weren't actually looking through it. The NSA said they were collecting and storing citizens' information so that it would be available should they ever want to take a peek at it, which, they assured the public, would only happen after they got permission from a judge. In other words, collecting everyone's data wasn't spying on them because, according to the NSA, they weren't looking at it...yet. Snowden was celebrated by many as a whistleblower – that's how he thinks of himself – but condemned by others as a traitor. This film has some amazing strengths, the biggest being that Poitras was right there in his Hong Kong hotel room to capture Snowden's determination and anxiety as he became front-page news the world over. But it has a notable weakness: you have to be a detective to figure out, from what's shown, why anyone would think Snowden a traitor. One key scene that gives a hint as to why occurs in a newspaper office where an editor and reporters are debating what of the information Snowden gave them is safe to release to the public. In other words, Snowden gave out classified materials that were dangerous to US interests, and he left it up to a bunch of journalists to decide what was and wasn't safe to release to the public. That's crazy! But whatever we think of Snowden, it's clear we should be upset with the US government. Now, it is hard to find a clear biblical basis for a right to privacy, so on that front it may be hard to condemn what they have been doing. But it takes no effort at all to find a warning about government intrusion (1 Samuel 8:10-19). We also know men are not angels, and so it is best not to entrust them with tools that can only be used properly by angels. It's naive to think the very same government group that lied in the first place about collecting our information can be trusted not to look through this information without a warrant. Even if they do go the legal route, Snowden noted that whenever the NSA goes to a judge to ask to look through someone's data the judge always grants approval. So that is no check on abuse at all. One of the more common Christian responses to the government surveillance states is to wonder why, if we've done nothing wrong, we should make a fuss about the government watching everything we say and do? That's a question best answered with another: have you ever done anything that might, if seen in the wrong light, seem wrong? Harvey Silverglate makes the case that the average ordinary American citizen arguably commits Three Felonies A Day inadvertently, due simply to the sheer tonnage of laws on the books. So we're already in a situation in which the government can, if it wishes, convict any one of us. Do we really want to entrust them with a permanent record of all our activities? I have a proposal. We need a law that says that there will be no surveillance of the American people that has not first been test-driven for five years at the Capitol building and its environs. You tell us the drink is not poisoned, so you drink it. Sweeps of phone records, busting into emails, targeted review of IRS records, tracking of movements through security gates, and surveillance drones overhead. All such records gathered will be open to Freedom of Information Requests, and will be provided to primary challengers free of charge, and with no names redacted. Why do I want to do such a thing? National security, ma’am. 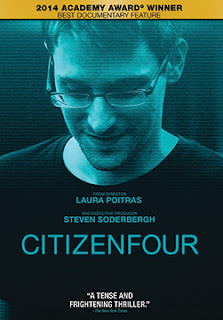 CitizenFour is rated R for language, and that is primarily for the use of the f-word which pops up a dozen or so times. But there are two instances of God's name being used in vain. I don't normally recommend films that take God's name in vain. In fact I earnestly avoid doing so – this website exists largely to recommend excellent films that don't misuse God's holy name. As Christians we're also worried about the violence and sexual content in a film, but we know that in both those cases there are depictions that fall "in bounds" – we aren't concerned with couples hugging or with heroes punching out villains. But there is seldom any excuse for taking God's name in vain. You want viewers to know your character stubbed his toe? Have him say "Ouch!" Does the protagonist need to express frustration? Then have him say something with some volume. But there is no need to use God's name as an expletive. So why the exception in this case? Because this is not entertainment. While this documentary would be better if it didn't include these two instances, the information found here is information we need to know. That makes it very different from a film we watch only for entertainment. When our viewing is simply for entertainment's sake then there is no need to tolerate blasphemy. But when we are watching something for education's sake, then we may have good reasons to sit through some sinful depictions, including those of blasphemy and violence. One last caution: a brief kiss is shown between reporter Glenn Greenwald and his homosexual partner. At movie's end Snowden and Glenn Greenwald are in the same room, sitting side by side, but making use of a pad of paper to carry on parts of their discussion. Why? Because it's the only way they can be sure the government isn't listening. This is a film everyone should see to learn about our governments' surveillance capabilities – as citizens the only way we can rein in government abuses is if we understand what they are. This is also a move to be shared and discussed. To help you carry on that discussion I've included a couple links to helpful articles that look at Snowden and the NSA from a Christian perspective. You can buy a copy at Amazon.com by clicking here.